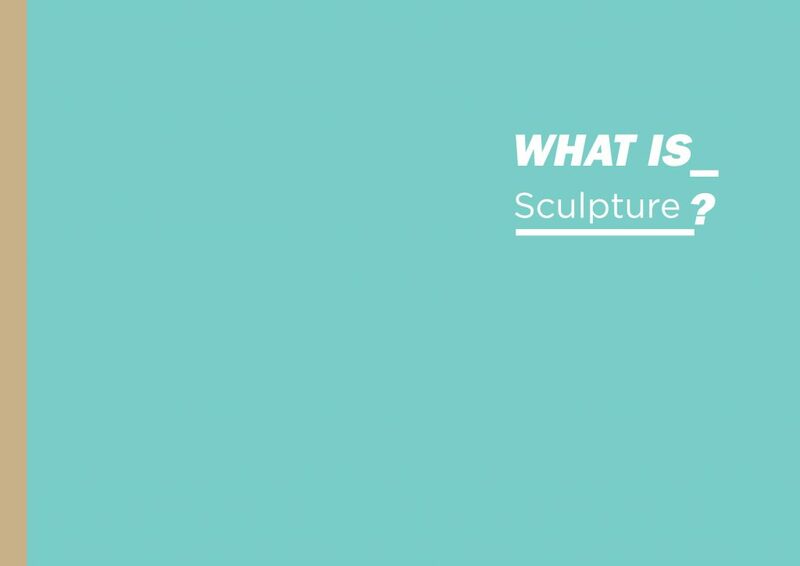 A lot of ‘stuff’ could be referred to when asking the question ‘what is sculpture? ‘ It would be easy to become snowed under by such stuff and, in the hope of capturing its diversity, anxiously produce a list of keywords, names, descriptions of materials, processes, works and affects. I could then attempt to find a logic that might point to how all those things are caught in the net of such a category. Should this trail take the historical route? … but then where should I decide to start?… with the Greeks? Or do I go as far back as some of the oldest known ‘sculptural’ archeological artefacts such as the ‘venus figurines? ‘ These however pre-date our category, concept and understanding of ‘art’, as well as of subject, object and space, all of which are also historically shaped notions. And these inevitably frame any questioning around ‘what is sculpture? ‘ Asking what sculpture might be involves therefore many different intersecting histories. As well as an art history made up of periods, movements, artists and styles, we may need to include the cultural and anthropological histories of monuments and commemoration, of architectures and statuary, histories of votive rituals, totems, religious fetishes and decorative or symbolic architectural embellishments. Are all these relating to the same thing or, when approached through the lens of one of these histories, does the question ‘what is sculpture? ‘ itself show a plasticity and keep shifting its form and meaning? Matter, materials – the stuff that art gets made out of – also have histories, those of functions and effects, histories that lead us to question how we think about the role and phenomenology of things, leading to fundamental questions such as ‘what is matter… ? ‘ Art as sculpture is a practice in dialogue with these histories. Highly significant for sculpture whether taking place as structures, objects or spaces are the tensions and polemics of how cultures, societies and individuals approach the practice of ‘giving form to …’ of creating objects to draw attention to a material presentation or ‘stand for’ or ‘in place of’ something or someone. These show themselves through different strategies of representation ranging from celebratory forms of construction to oppositional practices of iconoclastic destruction to spaces that reflect prohibitions against idol-making through providing a place for nonrepresentation. The question of sculpture also demands that we think about the ‘object-nature’ of art, its physicality, its materiality, its spatiality, its tactility. These questions in turn pose the further question of how sculpture is in relation with our embodied and temporal sense of being. It is therefore also the history of affect and the phenomenology of how we, as thinking-bodies, experience the concrete material world. Sculptures can also be determinately different from this, showing a mute material refusal of psychological readings or projections. Sculpture often poses questions itself in terms of how it may sit in the context of everyday functional things, which we more usually differentiate (in often contested ways) as design, craft or architecture. And many sculptures now play self-reflexively with these discourses and disciplines through the recent sculptural history of the ‘ready-made’. Further, we might also, in response to the material strangeness of sculptural practice, ask ‘what is the role of non-object making, of de-materialising and performative practices within sculpture? ‘ Thinking about these questions often operates by using the strategy of binary distinctions and relations, such as those between matter-form and form-function and form-content. Often it is through the very staging of these tensions that ‘sculpture’ takes place. Therefore the simple clear elegance of the question ‘what is sculpture? ‘ may unfortunately need to be rephrased here into the more awkward form of ‘what task does art set for the materials we encounter, when we encounter them as something transformable into something else, yet without a clearly designated functionality determining its final form? ‘ Sculpture, as well as transforming materials into ‘art’, is also often required to perform other functions – its art ‘work’. At times this may require it to represent, to depict, to affect, to evoke, to commemorate, to monumentalize, to decorate, or to physically stop us in our tracks and make us think or be amazed or surprised. If it is the kind of sculpture that is so effective that it physically stops us in our tracks, then what happens when that happens? Does sculpture demand that we look, or touch, or ‘don’t touch’? Are we required to imaginatively or literally activate it, participate as spectator from the ‘outside’ or become a necessary component material or participant ‘within’ the work? The sculptor Eva Rothschild puts it like this, ‘the question of its materiality should lead to a kind of intense looking where a sort of exchange takes place. Rather than a sort of passive looking, there is a sense of search, as sense of […] demand from the eye in terms of what the sculpture might give it. 1 This approach might at first seem to emphasize the visuality of sculptural objects, but for all its fascinating visualities, a defining feature of sculpture is that it is never fully reducible to an image or verbal description (even though many sculptors may use image and text as components). Regardless of how high the quality of a particular documentation image or descriptive text is, it is always necessarily inadequate when it comes to those aspects of sculpture that by their sculptural nature can evidently not be presented through image and text as such. What is not reducible to an image is perhaps therefore what is most ‘sculptural’ about it, what is untranslatable. Just think of the experiential tactile impact of materials, structures and volumes and their affective qualities, such as hardness, roughness, smoothness, shininess, hollowness, transparency, solidness, spikyness, furriness, smelliness, disappearing-over-time-ness, stickiness, delicacy and all the almost infinite nuanced physicality of materials and forms that I can merely evoke here, but cannot hand to you to touch and feel. I could show images that depict these but these would not communicate their visceral impact as a sculptural experience. A crucial example for sculptural effect is that of scale. In order for something to appear huge or tiny the sculptural effect requires a shared space where a direct physical relation between our body encounters the other physical elements. Phenomenologically, sculpture is therefore a very different way of engaging with artwork than that which we experience through an image. Sculpture’s way of using materials engages us by being able to affect our embodied situation through its situatedness, through the capacity to walk around it, experience it from different angles and sometimes in different spaces. (This can include different, complex and perhaps contradictory sculptural sensations we may encounter from, for example, tactile, plastic, free-standing ‘presences’ to the staging of immaterial, ungraspable ‘absences’). Like a body or an architecture, one of the potentials for sculptural objects is to create an inside and an outside. Boundaries are formed which create new spaces, volumes, and interventions in already existing spaces. These new spaces can be created by a sculptural intervention or sculptures can dynamically reactivate previously existing places. Some sculptures appear as singular objects that aim for a decontextualised autonomy, their aspiration to be as if impossibly selfcontained, ie. a ‘pure-object-in-itself’. Others are made up of many different objects, forming component parts of a wider whole or constellation points in a series operating as a network of encounters. Some ‘sculptures’ are not even physical objects per se but the staging of interactions between materials and forces, or a showing by means of something else. Some move in the direction of merging with architecture and some in the direction of commodity and some seem to hardly exist except as a set of instructions related to the idea of what it might be. When we engage with such phenomena as art-objects we are necessarily then led also to focus on how these relate to their support structures and frameworks. These are never separable aspects whether literal, conceptual or metaphorical and can be fascinating structures themselves. They include quasi-sculptural objects and spaces such as plinths or podiums, display cases, plazas, museums, galleries, public sites, private rooms, gardens, sides of motorways, boxes, mantelpieces, pockets, etc. Each space that waits or allows for sculptures to take place also reflects the changing histories of our relations to objects; for example, the courtyard of IMMA, once used for military rituals, displays and parades, now operates as an iconic open architectural setting, waiting for its next sculptural moment. The Highlanes Gallery in Drogheda is a ‘decommissioned’ chapel, repurposed and designed using a secularised white cube aesthetic with emptied alcoves and altar as part of its display area. The ‘Fourth Plinth’ project in London’s Trafalgar Square keeps active a public space for temporary sculpture, setting these in direct dialogue with a different culture of permanent commemorative monumentality. In taking on this task I requested permission not to rely on any images of specific artworks in this text, in preference for images of some spaces that might host sculpture. My justification for this ‘cop-out’, as well as the (as mentioned) inadequacy of representation through image of the question ‘what is sculpture? ‘ is that I am wary that any images I might have chosen would necessarily give a false sense of being exemplary. They might act as if ‘explaining, demonstrating or illustrating, ‘ as if pointing out the answer to the question ‘what is sculpture? ‘… but of course in another way, each different work has a sculptural reality and particularity that, when encountered, is exactly an answer because each keeps open the tension between a work’s singular particularity and its participation in the question ‘what is sculpture? ‘ This is not because the category ‘sculpture’ is now so huge that it indicates a meaningless relativity, but rather each work adds to the discourse on sculpture rather than closing it down. So, the term sculpture as we find it in a dictionary definition, is evidently no longer very evocative of what sculpture is. As a word ‘sculpture’ originally indicated a specific practice of carving or cutting and is now a loan word that gets applied to a wide variety of techniques and practices. It is interesting to note that ‘sculpture’ etymologically included the art of carving figures in relief and also the art of intaglio.3 This suggests that it may always have indicated a hybridity between object and form that emphasises the sense of materiality in any technique or technology, since intaglio is a form of printmaking that uses techniques of incision/cutting into a surface to make an image. Therefore the term sculpture perhaps focuses us on a sense of the material aspect of all artwork including those that operate predominantly through imagery. Every image has an object and material form for instance, where the image ‘takes place’ on a surface or through a screen with light effects, etc. This is why we can talk of both the ‘sculptural’ aspects of something that is not a physical sculpture as such and practices that are now forms of ‘expanded sculpture’ and installations which may not quite be limited to the experience of literally tactile objects as such, as may happen through screen-based or virtual technologies. I propose therefore that it may be interesting to consider ‘sculpture’ to be something akin to a Theseus’ ship. Theseus’ ship is the famous philosophical thought experiment proposed by the Greek historian and biographer, Plutarch (c. AD 46 – AD 120). It poses the enigmatic question ‘if all the material components of the object are replaced over time, is it still the same thing? ‘ It was added to by the political philosopher Thomas Hobbes (1588 – 1679), to provide what we could appropriately call here ‘the curator’s or conservationist’s angle’. He asked what if all the worn bits of the ship were collected as they were being discarded and reconstructed according to the original design? You would then have two ships. Then the question becomes ‘which would be the Theseus’ ship? ‘ The paradox opens out the classical question of identity and difference as an oscillation between materiality and essence and leads us to the enigmas of the affects of presence, change, time and continuity. If we think of sculpture as a Theseus’ ship, we might think of it currently as having sailed through a kind of modernity that reflects Marx’s description of ‘the solid melting into air’. Yet, after a focus privileging conceptualism, there is now currently a trend reengaging art with the question and nature of the ‘object’ and new ways of thinking materiality. Therefore, the story of sculpture seems like one where all that is solid melts into air … and then condenses and reforms into different stuff, objects or plasticities and presumably these will then evaporate again and reform again. An example of a work that uses sculptural means to pose these kinds of questions for sculpture is Shedboatshed (Mobile Architecture No 2), (2005), by Simon Starling, where a functioning shed on the banks of the Rhine was disassembled, with parts constructed into a boat that transported the other parts and all were then reassembled as a shed-sculpture in the Kunstmuseum, Basel. Our story of sculpture has therefore been intertwined with the history and tensions that appear between the brute fact of the materiality of an object and the question of how function might determine its form and the apparent immateriality of the ideas informing what an object is or may be. These places of fascinating tension, when thought about, may best help answer why 4 buckets of water, a tabletop and some rope is also not 4 buckets of water, a tabletop and some rope but a sculpture known as On the Table, by Michael Craig Martin – one answer among many other answers, within IMMA’s collection, to the question what is sculpture? Karl Marx and Friedrich Engels, Manifesto of the Communist Party, 1848. Robert K. Barnhart, Ed. , Chambers Dictionary of Etymology, The H. W. Wilson Company, p. 974.